Sadie - Turquoise & Lime Snap. Our Ginger Snapsâ„¢ interchangeable fashion collection just got biggerâ€”by getting smaller. Introducing Ginger Snaps Petite Collection! Same Snap-able fashion as the Ginger Snaps you know and love now in a new petite size. Made to wear alone or layered with existing Ginger Snaps jewelry Ginger Snaps Petites expands and enhances the Ginger Snaps experience. Petite Snaps will only fit in Petite Jewelry and will not fit into Ginger Snaps Jewelry or Accessories. 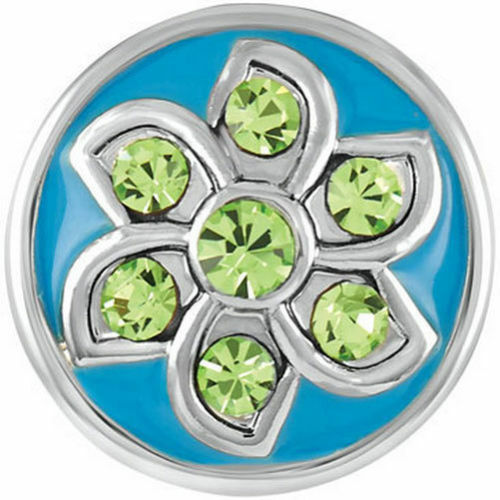 And Ginger Snaps charms will not fit into Petite Collection Jewelry or Accessories. Petite Ginger Snaps are silver plated so tarnishing may occur naturally over time. Please care for you Petite Ginger Snaps and Accessories by cleaning them with a dry polishing cloth. Please do not use liquid jewelry cleaners as these products strip the plating on all plated jewelry and will cause permanent damage. In addition please limit exposing your Ginger Snaps and Accessories to water (bathing hand-washing dishwashing etc.) and never wear them into a pool or spa.